A recently IVR telephone survey released by the Wendy Rogers campaign shows the Republican nominee pulling ahead of Democrat Tom O’Halleran in the battle for Arizona’s first congressional district. Out of 738 landline responses, Rogers polled 39.44% compared to O’Halleran’s 36.23% with 24.33% undecided. The margin of error is +/-4% with calls being made between September 27-28. These numbers came as a surprise to political insiders but especially the Democrat political machine which is spending millions of dollars attempting to defend congressional seats. Republican activists are beginning to call polling results like this and across the country, the “Kavanaugh Effect” as Americans opinions shift in support of President Trump’s Supreme Court nominee, Brett Kavanaugh. This shift began to occur when the Senate Judiciary Committee heard conflicting testimony from Kavanaugh’s accuser, Christine Blasey Ford that was later refuted by experts. 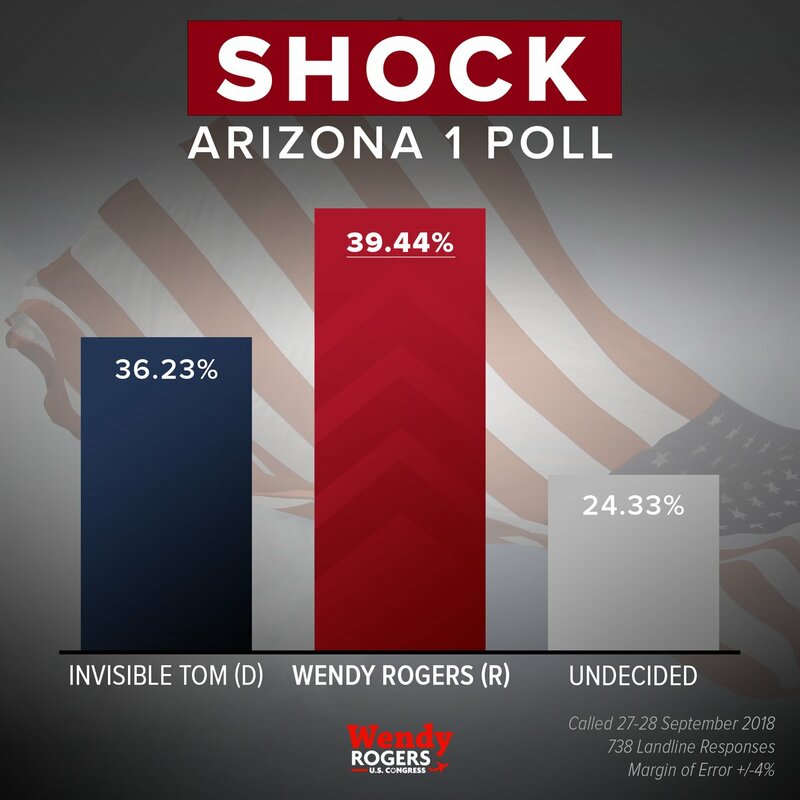 While this effect may be impacting Arizona’s CD-1 race, voters are also showing their support for President Trump’s supporters like Wendy Rogers who endorsed Trump early in the 2016 Presidential Primary. President Trump is expected to visit Arizona in October in rallies supporting Republican candidates. Rogers, who is known as one of the most persistent and hardest working candidates has a tough ad running against O’Halleran warning voters that Democrats like O’Halleran will move to impeach President Trump if they take the majority in Congress. The General Election is November 6th with early ballots being mailed on October 10th.